BIND (Berkeley Internet Name Domain) is the most wanted DNS software over the Internet. The BIND package is available for all Linux distributions including Ubuntu, which makes the installation simple and straightforward. 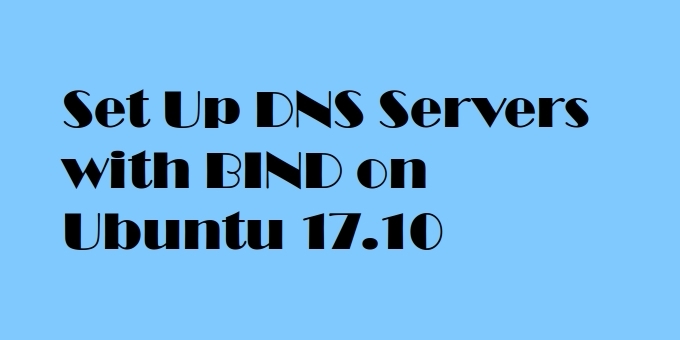 In this tutorial, we will show you how to install, configure and administer BIND 9 as a private DNS server on a Ubuntu 17.10. For the purpose of this guide, we will use the 172.22.10.0/24 subnet. 0 upgraded, 3 newly installed, 0 to remove and 17 not upgraded. After this operation, 2,996 kB of additional disk space will be used. Selecting previously unselected package libirs141:amd64. Selecting previously unselected package bind9utils. Selecting previously unselected package bind9. Created symlink /etc/systemd/system/multi-user.target.wants/bind9.service → /lib/systemd/system/bind9.service. We specify the PTR records for reverse DNS lookups in the reverse zone files. When the DNS server receives a PTR lookup query for an example for IP: “172.22.10.220”, it will check the reverse zone file to retrieve the FQDN of the IP address, in our case that would be “anyhost2.example.com”. Nov 23 10:58:30 nsrv1.example.com named: zone example.com/IN: not loaded due to errors. We will now configure the hosts in our 172.22.10.0/24 subnet to use the nsrv1 and nsrv2 servers as their primary and secondary DNS servers. This greatly depends on the OS the hosts are running but for most Linux distributions the settings that need to be changed reside in the /etc/resolv.conf file.